Vienna has an almost overwhelming number of attractions – and that is before you count the many summer palaces, castles and traditional villages that lie just a stone’s throw away. To explore the city fully would take days, but exploring by bike or Segway allows you to see all of the top attractions in a matter of hours, leaving the rest of the day soak up the atmosphere of the festival! Pedal Power were one of the first companies to offer bike and Segway tours in Europe, and have built a reputation as one of the most trusted companies around. They allow visitors to make the most of their time in the city with top quality guided tours that introduce you the city and hassle free bike hire to let you explore on your own terms. If you decide to head out of the city centre, they can help you with that too. Pedal Power might have racked up 19 years of experience, but their bikes haven’t; all of their bikes and Segways are brand new, top quality and safety checked. They are the only tour company in Vienna with such high quality equipment and pride themselves on having the best guides in town too. Whether you want to take a classic tour of the city, cycle out into the countryside, or glide effortlessly past the biggest attractions around Pedal Power are the perfect choice. The Ring is Vienna’s most famous boulevard, built where the old town walls once stood. The wide, open street was meant to be a declaration of the power and grandeur of the Hapsburg Empire, with impressive buildings erected either side, but The Ring also had another, more practical use – wider streets were harder to barricade, and allowed the use of cavalry charges against a rebellious population, and cities across Europe were radically redesigned in the wake of the 1848 revolutions. Built alongside The Ring in 1869, the Vienna Opera House is one of the most famous opera houses in the world. It houses over 300 performances a year by world leading orchestras, composers, conductors, soloists, dancers, ballerinas and, of course, opera singers. A ticket to one of the operas will set you back quite a few pints at the local pub, but the majestic building is worth a visit even if you don’t plan to see a performance. The most expensive of the buildings along The Ring is the Vienna Rathaus – a colossal Neo-Gothic building that stands just under 100 metres tall. The building is still used as the mayor’s office and, more interestingly, as a venue for everything from live music to Christmas markets to the world famous Vienna Film Festival. This is definitely an attraction to return to after the tour, with a charming garden to explore and a free guided tour to take. Hofburg Imperial Palace is a huge sprawling complex that encompasses many smaller attractions in their own right. Monasteries, chapels and museums vie for attention with the Austrian National Library, the Spanish Riding School, Imperial Treasury and countless more stunning Gothic, Renaissance and Baroque inspired rooms. Exploring everything here could easily eat up a day on its own. Visit these and many, many more attractions on one of Pedal Power’s Classic Vienna guided tours by bike or by Segway. 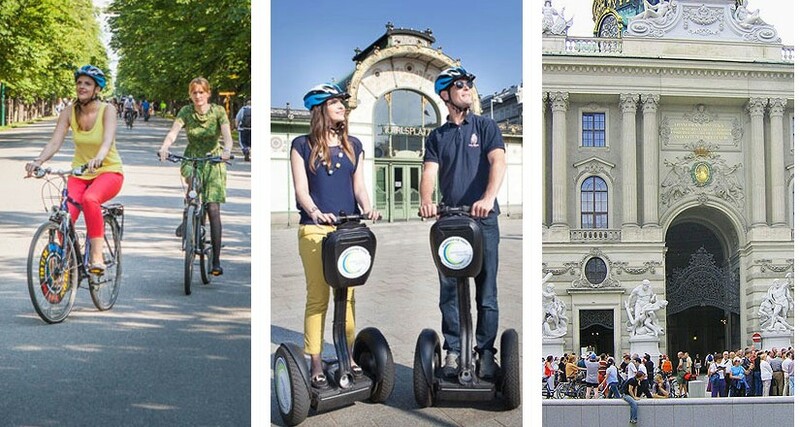 Pedal Power also do special Segway tours around Vienna. If you want to explore the city on a private tour, ride along the Danube away from the traffic, or visit the most colourful and festive Christmas markets in the city and see some cool sights along the way, then these are the trip for you. The extra distance you can cover by bike makes it the perfect way to explore Vienna and the surrounding regions. You and your guide can do everything from explore the city at night to embark on a mammoth 400km trip from Vienna to Prague along the Greenway Bike Trail. Fancy taking a self-guided tour? Need a hassle free way to get around the city? Vienna has over 1,000 miles of dedicated cycle paths making it easy and safe to explore by bike. Simply give Pedal Power your height and they will make sure you have a modern bike that is the perfect size for you to explore on.